It isn't really a pet peeve but something that is bothering me right now is my lack of girlfriends. It isn't that I don't have a lot of girlfriends... but they have all moved away or work weekends and I never have anyone to do fun girly stuff w/ on the weekends. It makes me sad. Hmmm... if I didn't have to go to school for it... probably a psychiatrist. 5. 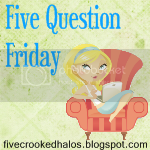 What is your one "splurge" item, that you will always buy, no matter the cost? There is nothing I buy no matter what the cost. Unfortunately, I work for the State and don't really have the ability to splurge like that. BUT, some of the most expensive items I do happen to own are handbags and jeans. NOW, my question to you. 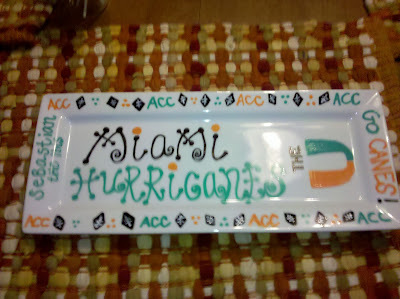 Yesterday, I painted a ceramic plate for one of B's friends who is visiting us this weekend. 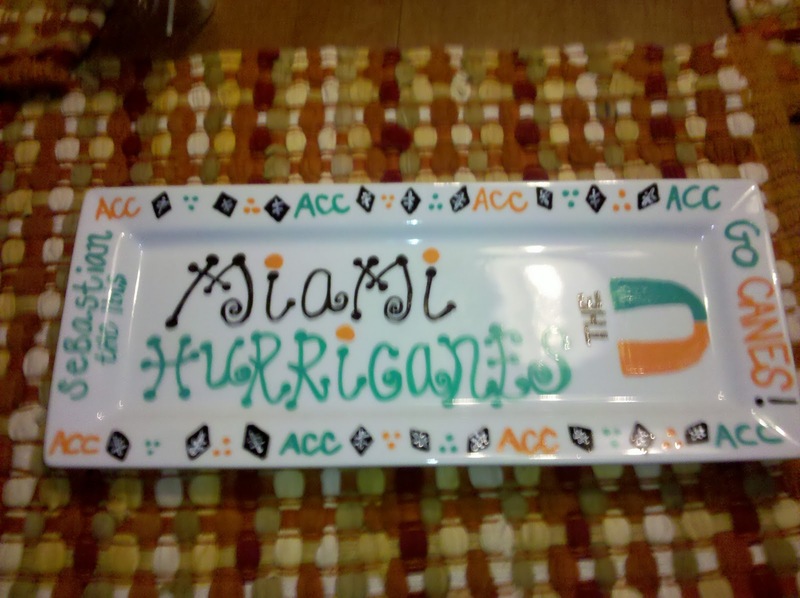 I have one for myself that I painted with a Clemson design... he liked it and wanted me to paint him one for the Miami Hurricanes. I thought that maybe I could make some money doing this... ya know, maybe sell them on Etsy. 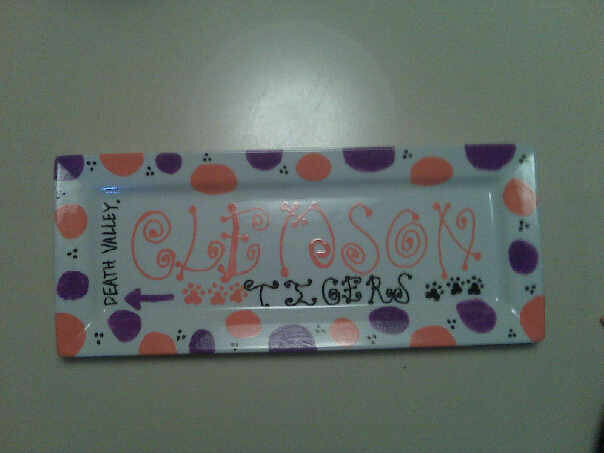 The plate itself cost roughly $10 at Wal-mart and I thought maybe I could sell them for $20 or $25. I could design them however the customer wanted... with a team theme... or simply paint their last name using colors of their choice. My question is... would you buy them? Do you think they are cute? I don't want to flatter myself by thinking they are cute just because B says they are... they are not perfect by any means... but I think that is what makes them great... they are custom made... imperfections and all! :) Any advice you have would be awesome! and i know what you mean about not having any girlfriends. i have a few girlfriends that live near by but the majority of them have boyfriends, husbands, and/or babies. all my SINGLE gf's live far away. I think they are super cute as well! I bet you could work your way up to selling them for more and doing all different designs, not just for schools. Your handwriting is great! I know exactly what you mean! Im with Beth! No single girlfriends :( Im not single either, but my boyfriend is long distance, so its not like he takes up all my time. And all the single girlfriends i doooo have, work, volunteer or study wknds :( And both my best friends moved away this summer. One to school and the other is a military wife :( boohooo. I wish you and Beth lived around here, we could start a girlfriends club! Oh my goodness.. I love SHAG! and I so understand about the lack of girlfriends! 1. Love the movie Shag. I've been trying to find it on DVD for not very much moolah. 2. Love the plates. Did you open an Etsy store? These would make great gifts. 3. Don't think I'm a stalker. I'm new to blogging (as I've mentioned) and with lots of free time at work, I've been reading about the people I follow (blogs that I find interesting.) And I tend to respond a lot. So apologies!